AIFF D License Instructors Course being held in Goa! Home / Indian Football / General / AIFF D License Instructors Course being held in Goa! The latest AIFF ‘D’ License Instructors Course is currently on at the AIFF Training Centre in Goa. 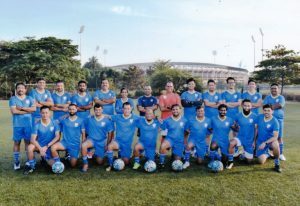 The course is being conducted by Technical Director Savio Medeira and Richard Hood to develop more instructors for conducting the AIFF D License Courses across India. The course has a number of former India international taking part. Previous English Premier League announces partnership with Coca-Cola! Next India U-16s Lalrokima: We danced & ran around the hotel after we qualified!